The Hearthfire Kagouti was available from the Crown Store for 040004,000 for a limited time. It returned on sale during the Morrowind Celebration Event in 2019. Its default name is "Emberscale". Hailing from the heart of Elsweyr, these striped mounts are known for their gentle and trusting natures. Once they found them incompetent as watchdogs, the villagers of Helkarn bred them to mountable size. The Helkarn Wolf white wolf with black and brown stripes that was datamined in Patch 3.2.0. It's default name is "Happy-Pant". The brown Highland Wolf is common in the Colovian hills and in Cyrodiil's Great Forest, where wild packs are feared by farmers and shepherds. But foresters have domesticated the beasts and, bred for size, use them as mounts. The Highland Wolf is a gray-brown wolf available in the Crown Store for 018001,800 . It was released alongside the Dark Brotherhood DLC. Its default name is "Rislav the Righteous". The Hollowjack Daedra-Skull Wolfwas available from the Crown Store in the Hollowjack Crown Crates as a Radiant Apex-level reward. Its default name is "?". The Hollowjack Flame-Skull Senche was available from the Crown Store in the Hollowjack Crown Crates as a Radiant Apex-level reward. Its default name is "?". Hollowjack Rider Bear is a mount available from the Crown Store via Hollowjack Crown Crates as Apex-level reward. Its default name is ? Hollowjack Rider Camel is a mount available from the Crown Store via Hollowjack Crown Crates as Apex-level reward. Its default name is ? Hollowjack Rider Horse is a mount available from the Crown Store via Hollowjack Crown Crates as an Apex-level reward. Its default name is "Pumpkin Palfrey". 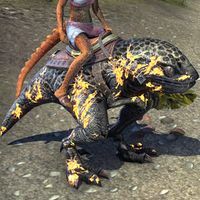 Hollowjack Rider Senche is a senche mount available from the Crown Store via Hollowjack Crown Crates as Apex-level reward. Its default name is ? 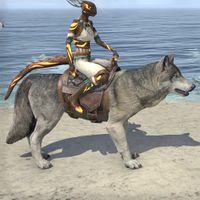 Hollowjack Rider Wolf is a mount available from the Crown Store via Hollowjack Crown Crates as Apex-level reward. Its default name is ? Hollowjack Wraith-Lantern Steed is a mount available from the Crown Store via Hollowjack Crown Crates as a Radiant-Apex-level reward. Its default name is "(? )".